Gagandeep Kang, recently appointed Executive Director of the Translational Health Science and Technology Institute, Faridabad, is one India’s leading clinical scientists. At the ongoing Young Investigators’ Meeting 2017, she talked about her work on diarrhoeal diseases in children and about sticking it out in research when nothing works. 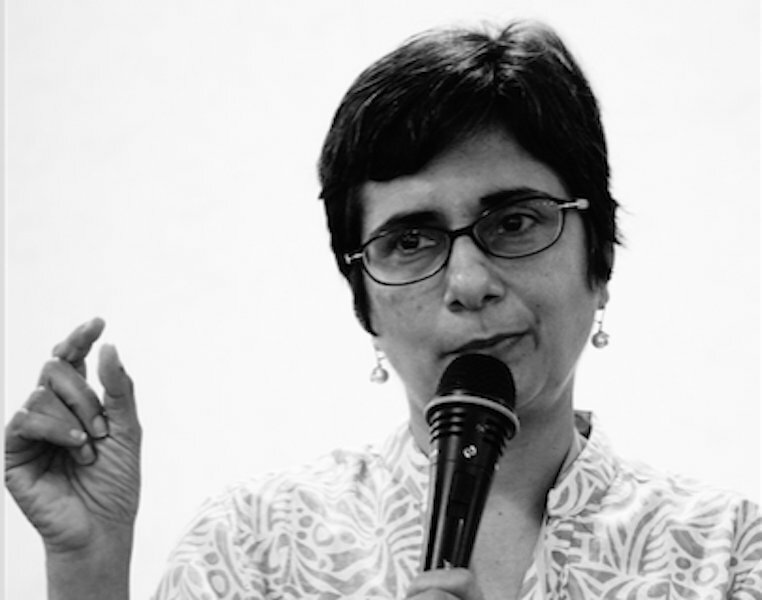 On international women’s day, IndiaBioscience chatted with Gagandeep Kang about her experiences as a women researcher. I got interested in science very early on. My father was in railways and I grew up in small towns, where your group is limited and you don’t have much to do on the weekends. So our idea of a fun time was establishing a lab and doing experiments. Since my father was an engineer, most of it was physics and chemistry. Every where we went, depending upon what I was studying or not studying or something that he had read about, we’d end up using one of our spare bedrooms to do experiments. And, it was fun! I knew I was going to do something with science but it just made more sense to me to go into medicine. By the time I finished medicine and my post-graduate training, I knew taking one patient at a time wasn’t really enough for me. I wanted to go into research where you could think about doing things that are based more upon the principle than the practice of individual medicine. What is the most exciting research you’ve been involved with in the past? Is there one thing you’re currently working on that keeps you awake at night? The most exciting research that I have been involved in is the development of Rotavirus vaccine. The reason it is exciting is that you spend an incredible amount of time and effort doing a study without knowing what the result is. And then one fine day you finally have enough to say, now we can see whether it worked or not. Given that my experience is largely one of failure it was pretty exciting to have one that succeeded. To answer your second question, currently with oral vaccines with most enteric infections, we make products without understanding them. Other than polio we don’t have a correlate of protection for anything. We’re on a long road now to finding a correlate of protection for rotaviruses and novoviruses—20 years done and still plenty to do. Who are your women role models and not necessarily in science? I have two. One is a scientist, Mary Estes, with whom I did my postdoc. She is a molecular virologist at Baylor College of Medicine, USA who has done phenomenally well. Everybody in the field knows her and respects her. She is still active at the age of seventy and expects to continue. I think the year I spent with her really transformed me. The other person is my mother, who kept working through many, many moves that my father had to make. She’s always had that incredible attitude that nothing is impossible. How easy or hard has it been for you to achieve a work life balance. And, how do you think institutions can help in this regard? If you ask my family, they are likely to say that I don’t have a work-life balance; I have a work life. I think institutions that allow women to take care of their children by being flexible and providing on-site support services are very, very important. Some people will manage anyhow but you need for the median and above to manage as well. Do women benefit from being mentored by older women and do they need to be mentored differently? No question about their benefiting from older women mentors. When I started hiring in my lab, without realising, I actually ended up hiring women only. When we finally reached a stage when there were equal men and women graduate students, it was pointed out to me this was a new situation for the lab. For women I have mentored, I notice that time spent talking to successful women is what allows them to have the confidence that they can also do it. I think it really matters. And one of the issues is, the busier you get, the less time you have to spend at an individual level and you have to consciously try to overcome that. Does your organisation have a cell or policy to address sexual harassment? Do you talk to your students and post docs about these issues? I am new to the institute but yes, we do have such a cell. In fact, tomorrow we have gender training for all of the staff of the institute. And, that is something that I have asked to be a regular feature for new inductees as well. Do you think there are particular structural road blocks that impede the progress of women in science? There are plenty of cultural road blocks. Structural road blocks—like things around leave, having a lack of access to support facilities and a lack of structure flexibility in how people work. If you were to say you want to change your working time and the institution doesn’t allow, it is one simple way of how systems don’t allow you to function as you should be allowed to. Would you say that through your career, things have become better for women in India? I think things have definitely become better for women in India. I am starting to see more young women in science who are enthusiastic, who are not worried about needing to give it up in the near future. So I think things are better. Not ideal but improving. One change that will hugely benefit the young women scientists who are just making their way in? I think completely flexible timings would really help. And, institutionalise that, don’t make it a favour. One piece of advice that you wish some one had given you when you were starting out? That’s a tough one! Don’t be afraid to say no. It took me a long time to learn that.